Here is what I believe to be the front page of the first issue of the Metamora Herald published on December 20, 1889. Not certain since it is difficult to make out exactly what the number is there near the top right side. There was a paper published prior to this but it was dubbed the Woodford Sentinel. Included below is a link to a high-resolution document, in case you might like to actually read that very fine print. The publisher sure made efficient use of space! If you would like to see a specific issue or page from days past please feel free to let us know. 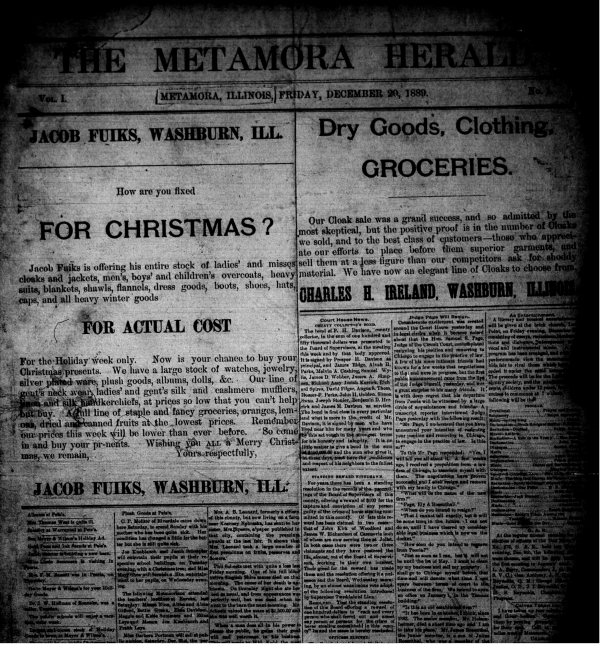 We would be more than happy to share what we dig out of the microfilm at the Metamora Library. Click here for high res pdf.